Many Human Machine Interface (HMI) software solutions enable IoT connectivity in a variety of ways. Here’s a look at how to do it, along with instructions for configuring an HMI. Machine builders are connecting their automation systems to the Internet of Things (IoT), and many Human Machine Interface (HMI) software solutions enable IoT connectivity in a variety of ways. Whether IoT implementations are via a local network or a private, hybrid, or public cloud, proper security is critical, as is the selection of the right HMI software. HMI software has evolved in form, capabilities, characteristics, expectations, and purpose. While providing a graphical interface for local operators and the process are the leading HMI requirements, modern HMI software based on open standards goes way beyond this basic functionality to provide many other features. A smart HMI provides a powerful and capable platform to connect field devices to a secure cloud. 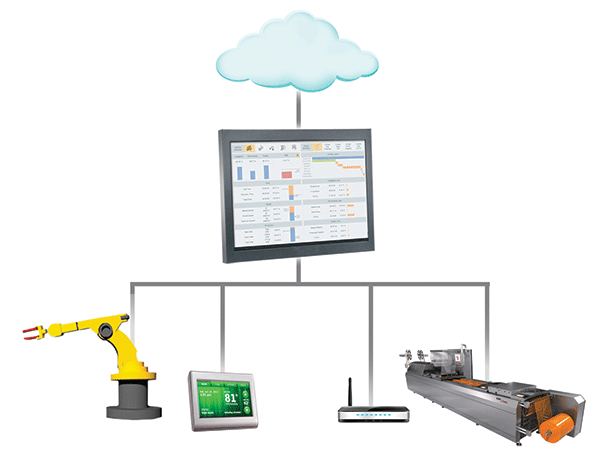 A modern HMI can be either embedded or PC-based. An embedded HMI runs on a dedicated platform powered by an operating system such as Windows Embedded or Linux, while a PC-based typically HMI runs on a full-featured Windows operating system. PC-based HMIs are more powerful and more expensive, while embedded HMIs often provide sufficient capability, and are always lower in cost and simpler to setup and maintain. With either type of HMI, functionality beyond simple operator interface can transform it into a smart HMI. Smart HMIs have open architectures enabling use of a variety of off-the-shelf hardware and software. They work with a variety of operating systems, and allow use of open technologies, such as ActiveX, Extensible Markup Language (XML), and .NET to visualize documentation and videos, and to listen to audio messages. The ability to open, edit, and save spreadsheets, documents and Adobe files is another feature of open architecture HMIs. This openness also allows development of a single application deployed on many different platforms including Microsoft standard, embedded, and mobile Windows. Some smart HMIs also support versions of Linux, VxWorks, and other embedded operating systems. These HMIs must connect to a wide variety of controllers and devices. Although some limit the types of connections available to their proprietary controllers and other components, other HMI suppliers support hundreds of drivers for programmable logic controllers (PLCs), controller, Object Linking and Embedding for Process Control (OPC, client and server), TCP/IP, and other connections. Smart HMIs also include built-in integration tools for quick connections to networks and the Internet. These tools are typically menu-driven and create connections by filling in the blanks with information with respect to the device to be connected and to the type of network. These smart HMIs can easily tie into enterprise resource planning (ERP) and “back-office” systems using built-in relational database connectivity. These drivers and open architecture also make integration with legacy and proprietary systems (using application-program interfaces, for example) fast and reliable. 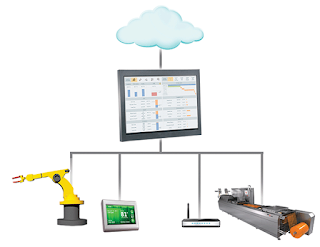 Platform-agnostic, full-featured HMI software provides the opportunity to reshape automation-system architectures and eliminate constraints imposed for decades by closed systems. For example, it is now possible to deploy the HMI software on the same hardware where the real-time control software is running, such as a PC. Smart HMIs with platform-independent Thin Client visualization based on HTML5 are a good choice considering the wide variety of PCs, tablets, and smartphones available that support this standard. Automatic scaling of graphics allows key performance indicators, overall equipment effectiveness, and other summary information displayed on these Thin Clients without the need for custom programming. When creating a networked HMI application, a good place to start is with cybersecurity and system configuration. As with all network and Web-based automation-system connections, well-planned and robust security is necessary. Whether the HMI access is via a PC connecting to an in-plant network or a mobile device accessing the HMI via the cloud, all users must be required to go through an authentication process where they enter a user ID and a strong password. This authentication process is an industry standard and built in to the HTTP protocol. Smart HMIs allow deployment to a wide variety of mobile and fixed devices, and also provide built-in tools to maintain proper cybersecurity. Here is how to set up an HMI to ensure cyber security. Limit remote device functionality. Many security concerns involve access to the main HMI application from remote devices. The more remote the device, the less access it should be given. For example, an in-plant thin client will have a wide range of functionality, while a smartphone should probably be limited to viewing a small subset of data. Provide proper password protection. A strong password is just the start. Smart HMIs allow setting a minimum password size with certain required characteristics such as the use of letters, numbers, and symbols—thereby increasing password strength. The number of days until the password must be changed can also be set. Once securely logged on, it is a good idea to enable an auto log-off after a period of inactivity. In addition, while logging in, a lockout should be enforced after a present number of invalid attempts. Carefully configure network. Network configuration is a subject worthy of its own article, but here are some leading considerations. Cybersecurity incidents frequently involve an automation system or HMI connected to a corporate or business network, so the industrial automation network must be properly segmented from the business network. The automation network should not be directly connected to the Internet. Instead, there should be a proxy server, an intermediate network, or access controls such as a virtual private network. Consider creation of white lists by configuring firewalls to connect only to specific controllers or HMIs and through specific ports. Blocking all other network connections is part of a well-designed cybersecurity configuration. Configure the HMI to protect the development and the runtime platforms. Securing the development environment with smart HMIs is a good way to control access. Project settings, driver configuration, data sources, and network configurations can be secured via passwords and user-access methods. Even creation and modification of tags, screens, and tasks can be controlled. From a HMI runtime standpoint, controlling starting and closing of the application can be password-protected. This secure configuration extends to database read/write, creation of users, and access to the task manager. Once cybersecurity is established, it is time to move to the next steps for developing a smart HMI application. A smart HMI provides a variety of tools to create the application, design screens, and publish data to PCs and other displays. The collection of automation tools needed to develop HMIs screens is often provided right out of the box, and screen design is one of the areas of primary focus during HMI application development. If the HMI supports HTML5, much of this time can be saved because this standard provides “develop once and deploy too many” capability. This capability is commonly deployed with the main HMI acting as the Web server, and the remote devices accessing and displaying information via any Web browser supporting the HTML standard. Even with this capability, it is still important to consider how the HMI will be used on the remote device. A PC hosting the main HMI application displays comprehensive machine data and graphics, while a smartphone may just be used for a quick check of information. In general, HMI screens intended for display on a tablet or smartphone should be developed to show a limited amount of data. Showing the operator information that can be quickly viewed on these small devices can reduce operator information overload and eliminate or make it difficult to see information. Along the same lines, it is not necessary to make all screens developed for viewing on the main PC or embedded platform available for viewing on smaller devices such as tablets and smartphones. Instead, developers should just provide access to a limited number of carefully considered screens. With smart HMI development systems, downloadable HMI runtime applications target platforms via a variety of connections. For example, a specific application for a remote computer can be downloaded, started, and stopped remotely. Locally or via a wired or wireless Ethernet connection, the HMI application can be published and run by using simple menu-driven steps. Many HMI software development packages have built-in download tools to make these types of deployment easy and fast. HMIs with these built-in tools do not require USB memory sticks or other devices to download applications to remote stations. Instead, these tools allow download and upload of project files, run/stop control of remote applications, and runtime licensing. These tools are usually menu-driven, and only require the user to fill in the blanks as to the target device’s location on the network. With a smart HMI, runtime applications will run on a local or remote computer. If remote devices pass the security test, then they can view the HMI application. Permitted targets include a dedicated viewer such as a thin client, a tablet, or a smartphone. How does this all tie into the IoT? It starts with HMI connections to a wide variety of sensors and other field devices, which are what makes up the IoT. Many types of machines and other parts of industrial facilities house these devices. Once connected, these devices have access to the Internet through networks and clouds via the HMI. Whether inside the factory or out, local and remote HMIs are the window into the machine, production, and factory floor. 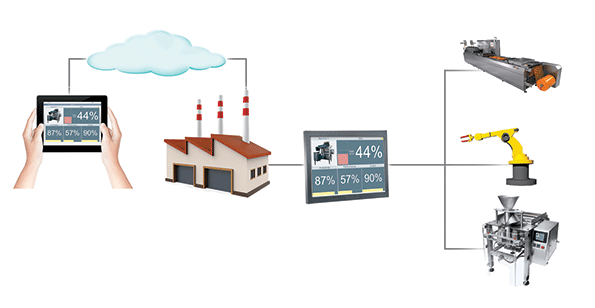 The HMI connects to a local, in-plant automation network for communication to field devices on a single line, cell, or system via a controller. Smart HMIs also offer the ability to directly connect to intelligent field devices such as motor drives, multi-variable instruments, and analyzers. As the connection moves outside the plant to distribute data to remote platforms, proper security steps should be taken as discussed above. In some configurations, these remote or mobile HMI platforms connect to the main HMI via the cloud. These clouds can be public, private, or hybrid. Public clouds must be carefully configured to protect data. More appropriate cloud-storage methods for industrial applications are private and hybrid, as both offer better protection of the data. These include firewalls, better passwords, or encryption methods. Private clouds are on-premises networks, and as such can offer in-house staff the ability to carefully and continuously monitor a high level of security of all connections. For example, it is possible to only allow connection to remote devices that are white-listed as safe, and deny all other requests for connections. Because the cloud is private, it’s easy to create and maintain a white list. Although there are many different types of hybrid clouds, the most common for an HMI deployment would be a dedicated and secure network deployed off premises and administrated by a staff of IT personnel, many charged with maintaining cloud security. Security procedures such as white listing can be implemented with a private cloud, but this will require close cooperation with the firm hosting the cloud. 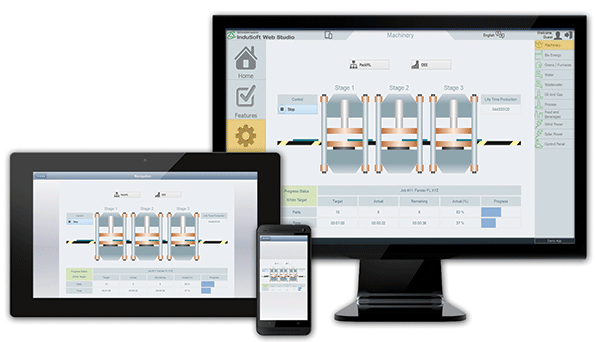 Smart HMIs support browser-based mobile access via the cloud, providing instant access to equipment and production data. The open-system authentication process on these HMIs helps users maintain data security without the need to become cybersecurity experts. This authentication process is an industry standard and built in to the HTTP protocol. Smart HMIs provide built-in tools and menu-driven instructions to allow connection to a wide variety of field devices, either through controllers or directly. Once data is collected, it can be securely distributed through networks and the cloud to a many different types of platforms including thin clients, tablets, and smartphones. The HMI should have tools and menus to enable data distribution in a secure manner without the need for custom programming.